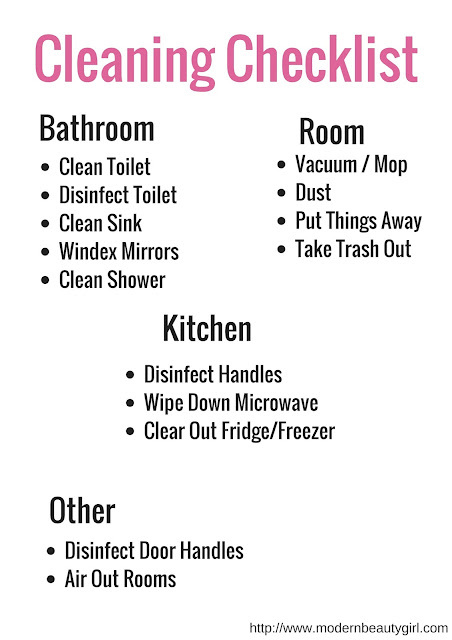 Modern Beauty Girl: Dorm Cleaning Schedule + Printable! I wanted to do another dorm type post all about cleaning! This is going to be generally geared towards those of you living in a dorm because that's what I'm currently doing, but the printable is definitely applicable to everyone! So let's get in to the good stuff! We choose to clean on the weekends (generally). Usually Saturdays, unless we're busy, then it usually happens on Sundays. The bathroom area alternates between rooms each weekend, while the room is done by my roommates and I every week. We have a fish that lives in the bathroom, so I usually end up cleaning that every week. Every other week I do a full clean of his bowl, and the other weeks I decant half the water and replace it. For the actual bathroom stuff, someone usually scrubs down the shower, someone cleans and sanitizes the toilet, and someone usually cleans the mirrors and scrubs the sinks. There are three people in each room so it usually ends up as one person does each, but it varies week to week. In our room we usually take out the trash and recyclables when the bins get full, which ends up being once a week or more. There's not usually a set day for it. I usually end up vacuuming the room on Saturdays as well. We tend to clean as we go with the microwave, fridge, and our dishes, so that doesn't have a particular day. Now for the printable! This is obviously not super all encompassing, but I think it includes the obvious (clean the tub) and the not so obvious (air out your rooms because the pollution indoors is often greater than outdoors). I didn't include any laundry things because people have their own different ways of doing that, although you should definitely do your laundry! You can right click to save this and print it out! Let me know in the comments how you clean your room/house whether you live in a dorm or not! Also, let me know what other types of blog posts you'd like to see as well!